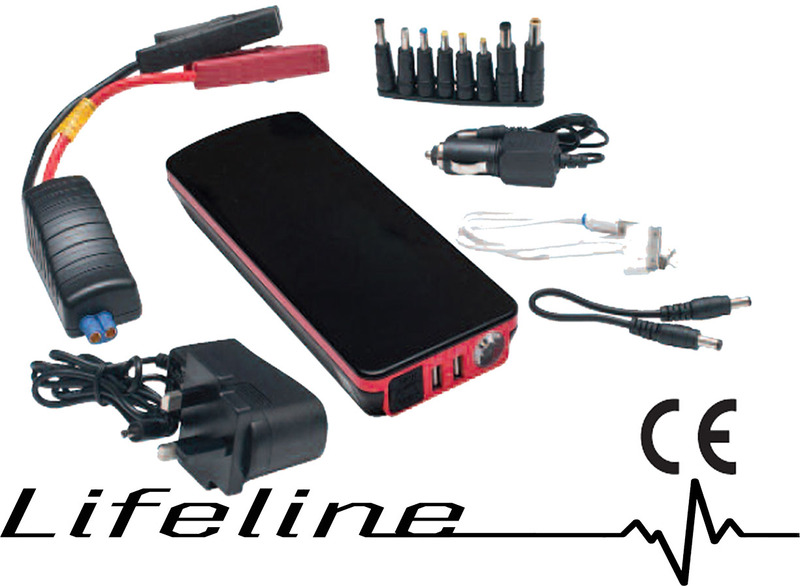 Powerspark’s newest and most capable ‘Lifeline’, the EP21 is a very lightweight and handy piece of equipment which will jump start your car or van when you are stuck with a flat battery and will also charge various of mobile devices including tablets and hand held gaming devices giving you portable power when you need it most. The EP21 is the ideal and perfect device for your garage or workshop. Also useful for your holidays, long journeys, festivals or corporate events as a backup device for those low battery emergencies. Weighing in at 615g this unit is very light weight, compact and sophisticated – supporting the new lithium polymer battery technology rather than the cheaper Chinese versions of the 18650, and would easily fit into a glove box, boot or on a shelf for maximum portability and tidiness. Looking at the design of the EP21 it is very modern with a sleek black and red finish, supporting a flash light with three different modes ie normal, strobe and S.O.S for any time where you might be left in the dark or needing a light source to hand. The EP21 also comes with a three way charging cable which includes a micro USB, IPod and the lightning connecter for the iPhone 5 and upwards models allowing you to charge and connect different devices. Not only will the EP21 include cables to charge your phone, the pack also includes adapters for Tablets, Notebooks, Laptops and also portable fridges. The EP21 will only take around eight hours to fully charge and will last 6 to 12 months, although we would recommend keeping the EP21 topped up every three months so you be sure not to be caught short. The EP21 will only take an hour to fully charge your phone; you can do this up to fourteen times on one full charge of the EP21 device. Using the EP21 to start your vehicle is very simple as all you need to do is connect the battery clips that are provided in the pack to your vehicle; turn the key and away you go. You can jump start a vehicle up to fourteen times on a full charge from one of these devices. When the device does not have any power left it will be indicated using the L.E.D lights on the top of the device 1 flashing being 0% and 5 solid lights meaning the device is fully charged. When you want to charge the device you can plug it into the mains at home or any standard three pin plug socket. If you’re not at home or near a plug socket you are also provided with an in car charger so you can charge on the move.